Welcome to the free Life Coach and NLP resources page. 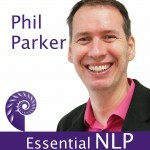 Here you’ll find transcripts from some of my podcasts – you can get the full set by signing up for the bonus content newsletter- and other valuable tools to help you learn and use NLP and coaching in your life and business. Like this series? Then please support it and keep it running by purchasing episodes 11-60. They cover the key skills of NLP, in depth, and take you on an amazing journey through this extraordinary field. Go to www.philparker.org or iTunes to download the rest of the series and new episodes. Available in a set of 10 podcasts priced at just £4.99 per set. Once you’ve listened to 11-60 check out the other free episodes.